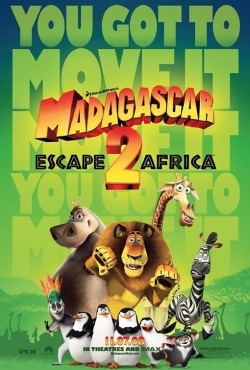 I enjoyed 2005’s Madagascar; it wasn’t a masterpiece, but it was a solid, creative, original and above all funny animated flick. I would say similar things about the original Shrek, also by DreamWorks. The idea of a sequel to Madagascar made me nervous based on the less-then-entertaining quality of the Shrek sequels; still, my recent interview with Tom McGrath, co-director of both films in the Madagascar series made me imagine that this sequel wouldn’t be the sort of unmitigated disaster that Shrek the Third was. While I wouldn’t call Escape 2 Africa a disaster, it is a staggeringly mediocre film that struggles to hold your attention for its brief 80-minute run time. The film opens with a scene detailing how Alex the Lion (Ben Stiller) was taken from his home in Africa, fell off the hunter’s jeep into the ocean, and floated in a box with one air hole from Africa to New York (meaning that there’s a very specific current running across the Atlantic…oh, never mind). This scene’s actually pretty good, and an effective way to open a sequel. The film then cuts to the four animals, Alex the Lion, Marty the Zebra (Chris Rock), Melman the Giraffe (David Schwimmer) and Gloria the Hippo (Jada Pinkett Smith) boarding an old airplane that the penguins have fixed up, which is set to fly them all back to New York. Naturally, the plane crash lands in a wildlife reserve in Africa where Alex reunites with his long lost parents. The film is essentially broken down into six sub-plots. Alex learns that real lions don’t sing and dance and disgraces his family in the process; Marty finds out that all Zebras are voiced by Chris Rock and are thus very similar, making him feel that he isn’t special or unique; Gloria wants to find a mate, and Melman becomes a witch doctor while working up the nerve to tell Gloria he’s always loved her. Of the four storylines, only the Melman-Gloria love story felt genuine. I mean, don’t get me wrong, this isn’t as amazing as the romance in WALL-E, but it is sweet and sincere and something that kids and adults will enjoy. But Alex’s story is generic and un-inventive, and Marty’s is just…weird. The fifth sub-plot involves the Penguins repairing the plane, and it is ridiculously funny. The penguins were the highlight of the first film, and they are the highlight of this one. Considering the best thing to come out of the Madagascar universe was the Penguin Christmas short from the DVD, I would say this movie would have been more enjoyable had it been distilled to ten minutes of penguin antics and shown in front of the far superior Kung Fu Panda. The sixth and final sub-plot revolves around the granny from the train scene in the first film who kicked Alex in the groin going to Africa on a safari and leading a band of people stranded after the penguins steal their jeep. Who the heck thought this was a good idea for a story? Granny just isn’t funny, and the sub-plot is grating. The script’s characterization is fairly lazy, and the phoned-in performances do not help. Ben Stiller is not a voice actor, and is as bad in this film as he was in the last one. Chris Rock, on the other hand, is very good as Marty, but doesn’t get a whole lot of screen time. David Schwimmer is funny up until the point where he confesses his love to Gloria, where his acting falters (I thought all his professing-of-love to Rachel on Friends would have prepared him, but…). Jada Pinkett Smith doesn’t have much to do as Gloria, but does it well. The team had good chemistry in the first film, but there are almost no scenes in the sequel where all four of them are together, which is disappointing. The final returning actor, Sacha Baron Cohen, does a fine job as King Julian, but the script writes him as the most effeminate male character in the history of animation, and never manages to spark even a giggle. This was Bernie Mac’s last film to be released, and he actually does the best job in his role as Alex’s father. The other new addition to the cast, Alec Baldwin as an incredibly blatant Scar-from-Lion-King ripoff, is awful. Just awful. I like Baldwin, but he can’t play a villain very well and he certainly can’t do voice acting. The character is such a rip off of Scar already, I say they should have gone the whole nine yards and cast Jeromy Irons in the role. Overall, the whole production feels generic and boring. It reeks of a greedy studio churning out a sequel with the least amount of work possible to make a quick buck. It’s plagued by the same problems as the Shrek sequels, including a lazy, uninspired story with awful sub-plots (seriously, Granny was painful to watch) and generally un-funny humor (except for the Penguins, who are truly a stroke of genius). That’s not to say the film is a complete bust. The animation, which retains the storybook-stylized look of the original film, is really fun to look at, and the bigger animation team really made the film’s images epic in scope. The film is funny once in a while, and I’m sure kids will be entertained. Now, some will argue that because of that, I should go easy on the movie. I would disagree; quality matters in family films too, especially when there are films out there like the recent WALL-E and Kung Fu Panda, two of the year’s best films. I love animation, and it makes me sad to see uninspired cash-ins like Madagascar 2 that don’t work hard enough to satisfy the audience. The result is something far too mediocre to recommend; Kids might enjoy it, but I could rattle off dozens of other family flicks that are much better.